Last month the European Central Bank lowered the bechmark interbank rate from 1 percent to 0,75 percent. The lowest interest rate to date, since the creation of the Euro. Together with this the deposit facility was lowered from 0,25 to 0 percent. All the billions of dollars that the banks with excess money held at the ECB where not getting any interest anymore. 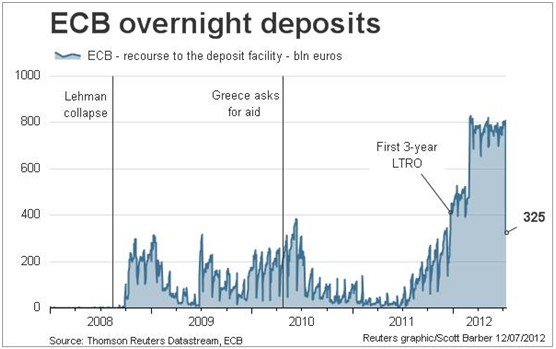 As you can see in the graph the deposits at the ECB, held by the banks, lowered dramatically when the ECB stopped giving interest. It seems the banks moved their money to the current account of the ECB, shown in the next graph. The banks don't get interest with their money at the current account, but it's more convenient than the deposit facility. 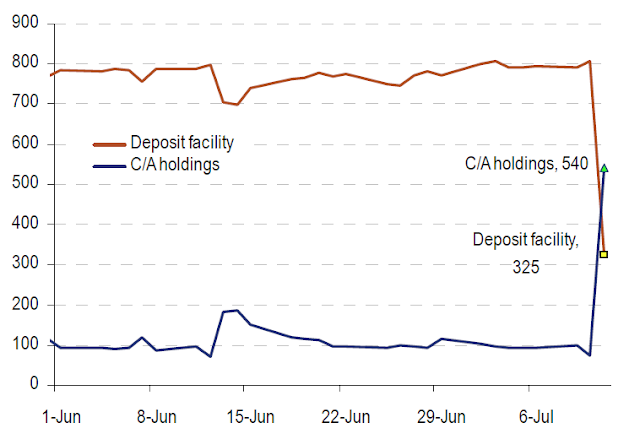 Since, in contrast to the deposit facility, banks don't need to move their money to the ECB every day at the current account.